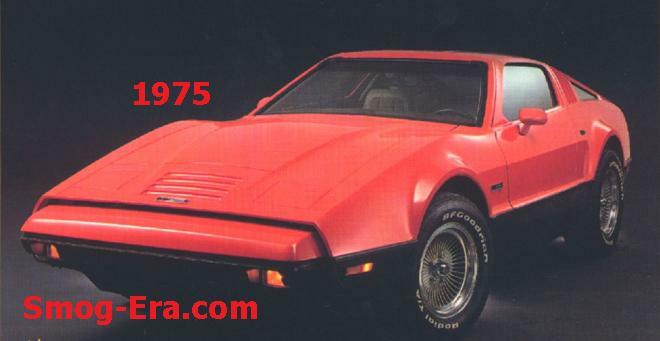 The Canadian company known as Bricklin started producing the SV-1 in 1974. The ‘SV’ part of the name stood for “Safety Vehicle”. Many features we take for granted in modern times were on this car. These were side impact beams, a built-in rollcage and 5mph bumpers front and rear. Every car featured gullwing doors. The interesting point of these doors were that they were powered. Opening and closing were done via pressing a switch. Five colors were offered for the outside which were molded into the plastic body panels. These were white, ‘suntan’, green, orange, and red. All interiors were beige and black. Oddly enough, ashtrays nor cigar lighters were available in them. In 1974, the SV-1 was powered by an American Motors 360 CID 4bbl V8. This engine made 220hp. This was the only year that offered a manul transmission, which was a four-speed. Both follow-up years had automatics only. For 1975 all the cars were powered by a 351 CID 4bbl Ford V8. This one made 175hp. Much like DeLorean that followed, Bricklin endured financial hardship. The Bricklin car company closed its doors in 1975, and all cars on the assembly line became 1976 models. The engine remained the same in the last model year. Just about one dozen cars were designated as ’76 models.